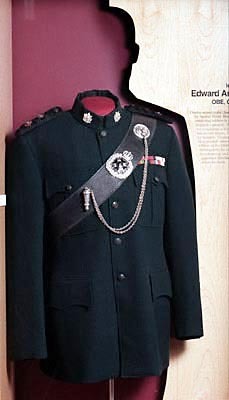 Edward Arunah Dunlop served in the Queen's Own Rifles of Canada before the Second World War. On 13 September 1943 he was instructing soldiers in grenade throwing when a soldier dropped a grenade. Dunlop attempted to dispose of it, but it exploded as it left his hand. He was blinded and lost several fingers. He was awarded a George Medal for heroism. 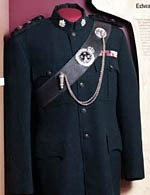 Dunlop was later active in rehabilitation of wounded veterans, for which he was made an Officer of the Order of the British Empire in 1946. Subsequently he was active in public life including broadcasting and politics. Colonel Dunlop was appointed Member of the Order of Canada shortly before his death.